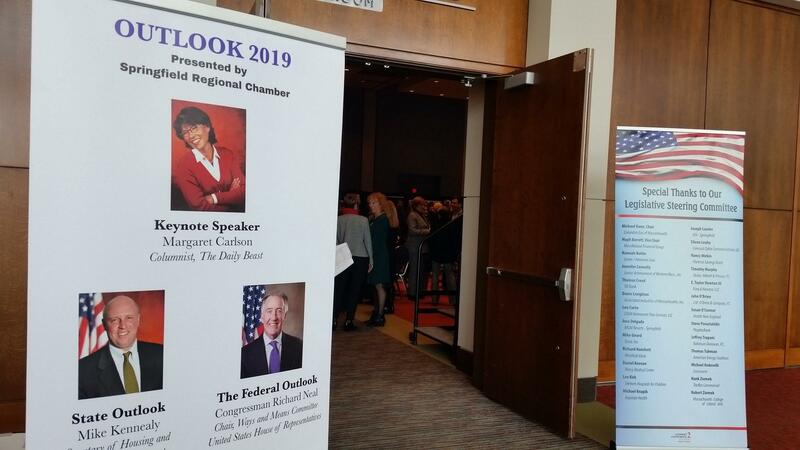 The Springfield Regional Chamber's premier event, the annual Outlook luncheon drew an estimated 700 people. The premier legislative event in western Massachusetts – the annual Springfield Regional Chamber’s Outlook luncheon – heard today from a leading Democrat in the U.S. House and the top economic official in the Baker administration. Congressman Richard Neal of Springfield, chairman of the powerful House Committee on Ways and Means, never mentioned “The Green New Deal” or “Medicare-for-All” – two proposals very much in vogue with the progressive wing of the Democratic Party — choosing instead to focus on legislative areas where he believes compromise is possible with Republicans. "I am a pro-growth Democrat," said Neal. " I have believed for a long period of time that the private sector creates wealth and the public sector creates opportunity." In his speech to the roughly 700 people attending the business group’s luncheon at the MassMutual Center, Neal cited infrastructure, adjustments to the Affordable Care Act, and trade reform as legislative priorities.
" We are going to find places where we can move our agenda," declared Neal, adding there is plenty of time for arguing "on the Sunday talk shows" and in the House. Neal said Democrats will introduce a bill in Congress this spring to address the nation’s crumbling infrastructure. He said changes are needed to the Affordable Care Act to protect people with pre-existing conditions from losing insurance. The Trump administration is expected to bring Congress new trade deals with Mexico, Canada and China. "On China, we have to be very very careful to make sure the effort we put forward to restructure the Chinese economy we can not just declare victory for the idea of driving the stock market up for two weeks," said Neal. Last week, Neal lobbied the U.S. Trade Representative to reverse tariffs imposed by the Trump administration on parts shipped from China to build subway cars at the Springfield factory of Chinese government-owned railcar maker CRRC. Massachusetts Secretary of Housing and Economic Development Mike Kennealy put in a strong pitch for support of the housing bill filed last week by Gov. Charlie Baker. "We have one significant threat to our economic growth and development and that threat is housing," said Kennealy. "We simply need more housing production across the state." The legislation, Kennealy said, is key to achieving Baker’s goal to build 135,000 new homes in Massachusetts by 2025. It mirrors a bill Baker filed last year that did not make it across the finish line of the legislative session. A key, but controversial, provision would allow communities to amend zoning laws with a simple majority vote of a city council or select board. Current law requires a two-thirds vote that housing advocates say is often an impossible bar to clear and is used by NIMBY factions to block construction of multi-family housing. Democratic State Senator Eric Lesser of Longmeadow said he is optimistic a deal can be struck this year on a housing bill.
" I think ( the housing legislation) last year was a little too top down, so hopefully this year we will engage local communities, hear what they want, and build the proposal that way," said Lesser. With input from a survey of its more than 500 members, the Springfield Chamber identified 300 bills in the state legislature to monitor this session, according to chamber president Nancy Creed. She said the top legislative priorities revolve around the issues of health care costs and energy supply and expenses. The keynote address at this year’s luncheon was by Margaret Carlson, columnist for The Daily Beast and former White House correspondent for TIME. High-speed, high-frequency commuter trains are running today between Springfield, Massachusetts and New Haven, Connecticut. There are high hopes the new service will take cars off congested highways and spur economic growth. Dozens of business leaders from western Massachusetts will be at the Statehouse in Boston Wednesday for meetings with legislative leaders and representatives of the Baker administration. Are we heading for a second shutdown? In today’s Congressional Corner, Massachusetts Congressman Richard Neal wraps up his conversation with WAMC’s Alan Chartock.